EncapSulite’s heavy duty WaterGuard LED High Output fixtures are the reliable, effective solution for your weatherproof lighting needs. These waterproof LED fixtures are ideal for food processing, sea coast areas, grocery stores, inspection areas, or any other industry or application. WaterGuard LED lighting fixtures are engineered to stand up to 1200psi high-pressure wash down without collecting water or debris. Three standard lengths are available. 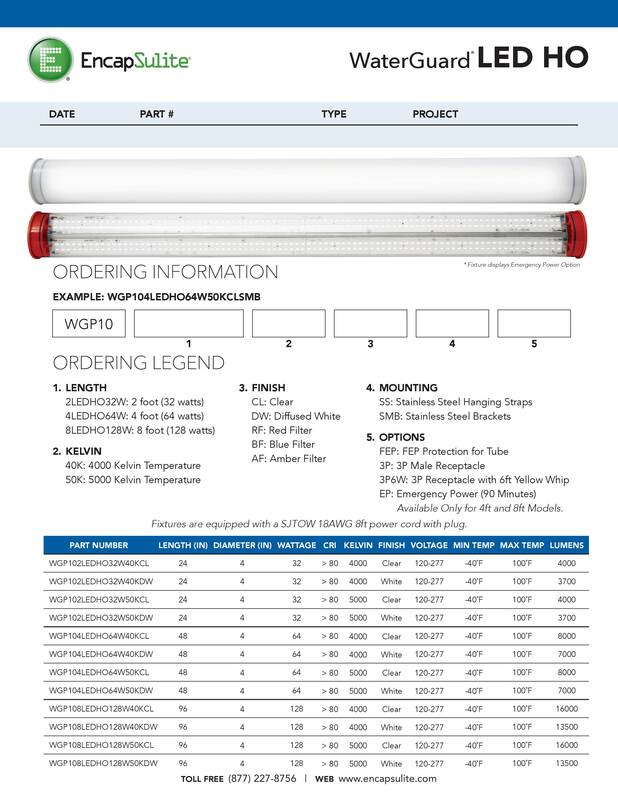 Request a quote on WaterGuard LED waterproof light fixtures, or contact EncapSulite to learn more. EncapSulite WaterGuard LED High Output weatherproof lighting fixtures include 50,000hr, Philips LED's. Also included are a universal voltage LED driver (120-277 50/60Hz) and a factory wired 8’ power cord with plug. UL 1598 listed (wet locations), UL 8750 (LED) and UL-EPH certified. FDA compliant for food safety. EncapSulite’s WaterGuard waterproof LED fixtures deliver unparalleled durability, longevity, and value. Request a quote or contact us for the weatherproof lighting solutions you need.